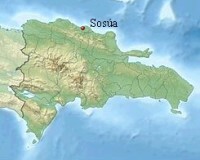 Sosúa is a small town in the Puerto Plata province of the Dominican Republic. The town is divided into three sectors: El Batey, which is the main section where most tourists visit, Sosúa Abajo, and Los Charamicos. 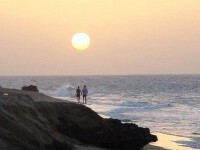 Charamicos is where the native live and in El Batey where the tourist center and most hotels are located. Between these both sides you can find the Sosúa beach (Sosúa Bay), the finest sanded and most know beach at the north coast, which is a crescent-shaped bay protected by coral formations. Sosúa's other beaches are Waterfront (Playa Alicia), Paradise beach (actually shifts on and off every several months), Playa Imbert and Playa Chiquita. Waterfront beach is just 13–14 years old, created after a storm around 2002. Activities like discos, restaurants and nightclubs can be found in El Batey.